I’ve noticed a troubling trend in the social media world. That’s not to say I’ve only seen this happen on social media; I just think its prevalence on the internet is further proof of an unfortunate epidemic. More and more writers are labeling themselves as “aspiring.” While I understand the place of humility that this label comes from, it nonetheless upsets me. When it comes to writing, above all else, you must believe in yourself–even if no one else does. Self-confidence is the cornerstone of a successful career. And again, if you don’t believe in yourself, why should anyone else? Confession time: I used to label myself as an “aspiring author.” I had that title plastered everywhere from Facebook to Twitter to Pinterest. It even fell out of my mouth when I met somebody new. I was writing every day and finishing what I wrote. I read all the time. I took classes. Still, I didn’t feel that I was good enough. One day, I had an epiphany. If I write, I’m a writer. There’s no “aspiring” to it. Like Yoda once said, “Do or do not. There is no try.” You either write or you don’t. Simple as that. Let me tell you something right now: Even if you’re not published, you are a writer. Even if you only write a sentence a day, you’re still a writer. Just because you’re not on the New York Times’ Bestseller List doesn’t mean your work is worthless. The next time you’re tempted to describe yourself as an “aspiring writer,” ask yourself why. Why don’t you feel good enough? 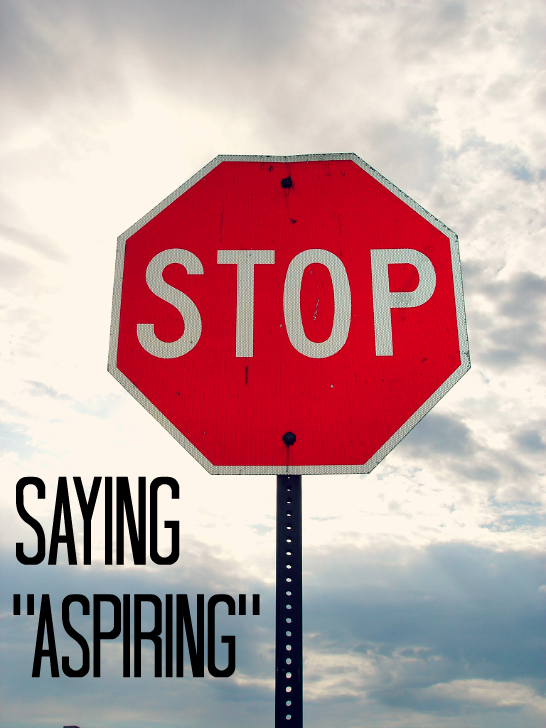 What do you think you need to accomplish in order to drop the “aspiring”? If you’re reading this post, you have my permission to drop “aspiring” from your title. Go ahead. I won’t tell. You might be surprised by how much better it makes you feel. What do you have to say to writers who think they’re not good enough? Wow. Well said. I hadn’t thought about that before, but you’re totally right. My profile on Twitter says “sometime writer.” I agree that writers undervalue themselves by using “aspiring” to describe themselves. I am guilty of this. I try to drop the aspiring or, worse, “wannabe” and feel a panic that someone will call me out for not being legit enough to call myself a real writer. But I write. I love writing. I couldn’t live without it. So I am a writer. Thanks for this post! It can be so liberating to drop the “aspiring” or “wannabe” from your title. I’m so glad you liked it! I think people who devalue others with “you’re not a real […] unless […]” statements are the root of this. I’ve been stung by those comments before (not just about writing) and I find it infuriating that people are so quick to impose their vacuous “standards” (unfounded notions) on others. If there weren’t people parroting negative messages about indie-/self-published writers, from what seed would spring feelings of not being good enough to drop the “aspiring” or “wannabe” qualifier? People can’t decide to take medicine seriously and then call themselves doctors, or decide to take law seriously and then call themselves lawyers. However, there are countless other things — writing, photography, computer programming, interior decorating, baking, etc. — that are well within the reach of those who want to take their work/craft seriously (which includes things like learning more, actively working/practicing, etc.) and grant themselves the matching title. I’ve been a writer for over 30 years, even though I didn’t have a novel on the market until about four years ago, and even though I never had that title bestowed upon me by some suit-wearing flunky in a big publishing company. For a long time I aspired to be published by such a company, but that made me an aspiring contract slave, not an aspiring writer! Well said! I wish I could do more to address and fix the problem you mention. These awful people who issue qualifiers are often the root of the “aspiring” issue, and it saddens me to think their comments can have such a profound effect on a writer’s self-confidence. And you’re still a writer even though you’re only recently published. I’m so happy you understand and celebrate that truth. 🙂 Thanks for commenting! Definitely agree with this post. I used to use ‘aspiring’ myself, then read the same thing about dropping that terminology from your vocabulary in a book on writing. Using ‘author’ anywhere in your title is incorrect until you’re published, just purely on the semantics of it. But ‘writer’ is all encompassing, and doesn’t require a qualification either – it’s not like saying you’re a doctor without the degree. I write because I enjoy it, although admittedly the ordeal of attempting to get published has pushed me to my limits. I write because I want to become an author; some people write just for their family or friends. Does that make either me or them different somehow? Of course not. We’re all writers at the end of the day, and trying to put qualifiers like ‘aspiring’ or ‘young’ or ‘up and coming’ just muddies the whole concept. So stand strong, if you’ve written one book or even just one sentence, you’re a writer, and believing in yourself is the first step on the road to taking ‘author’ off the shelf and adding it to your title. I am a writer (I write). I am an author (one short story published). I am a novelist (I have written and am writing a novel). It took a long time to realize that and update my profiles accordingly. There are those who disagree when I talk to them in person and I’ve stopped arguing with them over it. Instead I just let them know that they’re wrong. Thanks for sharing this. I know many people who just need to hear it from somebody else to believe it. Genuinely not trying to troll here, but I’m curious why you think you can only use the word ‘author’ if you’re published? All of the definitions I find refer to an author as a writer, with admittedly alternative definitions including those who do it as a profession. Hmm, my tag for my website is ‘Aspiring Author.’ So maybe that’s slightly different, I’m not exactly 100% sure, but maybe I just need to find a different tagline anyway. I wouldn’t say I necessarily find the word ‘aspiring’ negative, at least when I’m talking about myself, but I can see why others might, and can also see how this might have been a symptom of a ‘I better not call myself a writer’ mindset on my part. Great post as always Briana, food for thought. Thanks so much for reading and commenting. While an author is typically someone who has been published, anyone should be able to call him- or herself a writer. In standard usage, the two words have become interchangeable. At one point in time, the word “author” did specifically indicate than a person had been published. It’ll do wonders for your confidence, I swear!